Thessaloniki, being situated at the apex of the Thermaic Gulf, is the capital of Macedonia and is located in the northern region of Greece. With a very rich and varied history, Thessaloniki dates back almost 3000 years and is one of the more ancient cities in Europe. Thessaloniki was also home to Ottoman, Roman and even Jewish settlers at different times in history. The city is a repository of the finest relics from these civilisations, ensuring that a Thessaloniki tour will be an enjoyable experience. Thessaloniki was once the most important city of the Byzantine Empire after Constantinople. This Thessaloniki destination guide gives a basic breakdown of what there is to see and do in Thessaloniki. 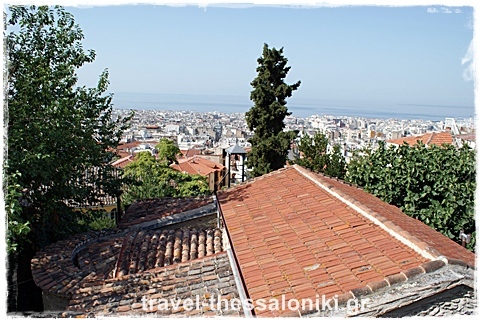 A perfect way to get to see the Thessaloniki tourist attractions is to take a local tour. For some general information about travelling in Greece visit our Greece country guide. You could also check out some of the local highlights of the nearby cities. 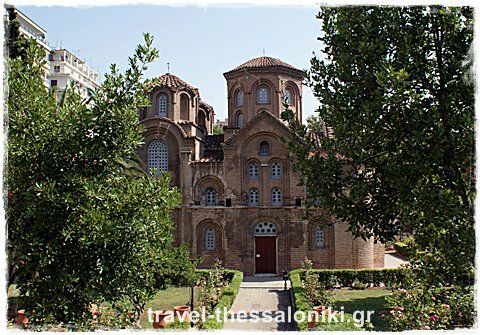 Thessaloniki is literally full of churches and monasteries, with many of them dating back to the Byzantine era. Most of the monuments are found near the center of the city and the "Upper town" ( Ano Poli - Άνω Πόλη). Regular services are held in most of them, so visiting in the morning hours is possible most of the days. Saint Demetrios is the patron saint of Thessaloniki. The Church of Agios Demetrios dedicated to him occupies pride of place among all the churches in this city. The Church has had an eventful history. It was first built just after 313 AD atop the remains on an ancient Roman bath and was essentially a small chapel. Around the 5th century, Bishop Leontios refurbished it into a large basilica with three aisles. This was burnt down somewhere between 626 AD and 634 AD. Before long, another basilica with five aisles was constructed, but in 1493 it was made into a mosque! In 1912, it was returned to the Christians only to be razed to the ground by a big fire in 1917. It was built again and resumed functioning from 1949. Hagia Sofia is a large Basilica (with a dome), reminiscent of the Hagia Sofia in Instanbul. It was built on the ruins of an earlier gigantic Basilica, which was destroyed in the 6th century A.D. The building started in the 7th century A.D., with many additions and modifications through the years. Hagia Sofia used to be Thessalonikis metropolis and cathedral during the years. The church has been modified to a mosque during the Ottoman Empire and was damaged from a fire in 1890. It was re-opened in 1913. Some impressive tilled pictures and decorations from 8th, 9th and 11th century have been preserved. The Rotonda was built in 306 AD as a Mausoleum or Pantheon for Emperor Galerius. As the name suggests, it is a circular building. 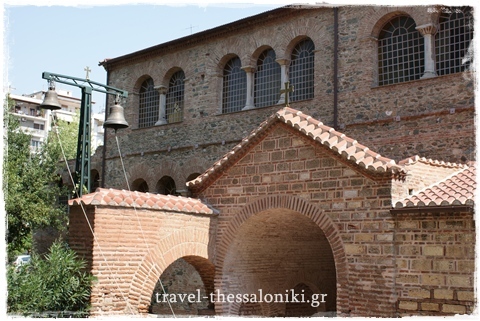 It was converted into a Church during the reign of Theodosius the Great and for many years it was the cathedral of Thessaloniki. The church was converted into a mosque during the Ottoman empire years in 1591, and a minaret was added. The minaret is still preserved, and it is the last one in Thessaloniki. 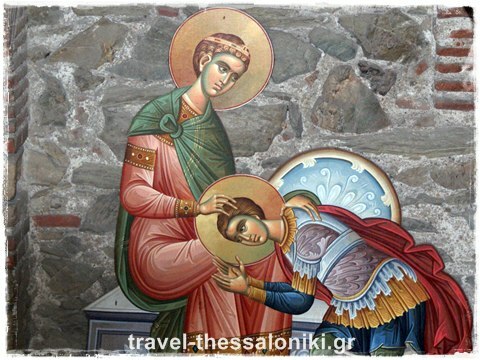 Panagia Chalkeon is the Lady of Coppersmiths. And of course is due to the churchs location. The surrounding area of the church from the medieval years up to now is citys centre for coppersmiths. It is a longitudinal church of the cross-in-square type, with a triconch sanctuary on the east and a narthex on the west side. The church was founded by the "protospathario" Christoforo, a Byzantine official, as is stated on the marble lintel of the main west entrance. During the years of the Ottoman occupation the church turned into a mosque and turn to church again after 1912, with the liberation of the city. The renovation started few years later and of course a project for the restoration of the wall paintings that Ottomans covered with whitewash. Nowadays the visitors have the chance to observe two layers of wall paintings that are dating back to the 11th and the 14th century. Vlatades brothers, Dorotheos and Markos, were the persons that founded the Monastery in the year 1360. The two brothers were members of the intellectual circle of the Metropolitan of Thessaloniki, Grigorios Palamas, who later was raised saint. He died in 1359 and a wall painting of him is decorating the interior of the church. It is amazing how the building and especially the Katholicon preserves features of the original building despite the several repairs and restorations. The unique interior wall paintings are a perfect example of the art style in the second half of the 14th century. Saint Minas is the protector of the commercial market of Thessaloniki. The original church of Saint Minas was built during the 8th century and it was the oldest church of the area. But Saint Minas Church along with another one that was built later destroyed completely by a series of fires in the area. Ioannis Kaftatzoglou was the person that sponsored the reconstruction of the church. The todays church is a building of 1890 and is based on a completely new plan. The only part of the original church that is preserved up to know is two columns together with some marble sculptures. The church was built in the 14th century. It was founded as the Catholicon of a monastery. It was believed to belong to Nea Moni Monastery, but it was later identified as the Monastery of Akarnios. The church of Prophet Elias turned into a mosque after 1430 from the Ottomans, and that time was that almost all frescos of the church were destroyed. Even after the renovation of the church very few wall paintings have survived. The church of course has features of a monastery. The church has triconch style and it is covered with a dome, and has two more semicircular structures that are attached at the left and right of the east apse. "Aceiropoietos" is a church that is dedicated in Virgin Mary and that means it was not made by human hand and the title is probably referring to the cult image. The church was built on the remains of Roman baths during the 5th century. Panagia Acheiropoietos is a three-aisled basilica with a narthex on the west side and a second entrance with a monument propylon in the middle of the south wall. This church was the first that the Ottomans transformed into a mosque during 1430 when they invade and conquest Thessaloniki. All the frescos and the mosaic of the church were destroyed almost completely. Now, after the restoration, the visitors can observe some parts of the wall paintings that date back to the 13th century that are preserved and also some fragments of the mosaics that have survived and date back to the 5th century. Osios Davis was founded at the end of the 5th begging of the 6th century. It was build over an earlier roman building and it used to be the catholicon, the main church, of Latomos Monastery. The original church was really small and square, with an entrance in the west wall and an apse at the east end. Afterwards, in each of the four corners a small chamber was constructed and lead in the creation of a cross with equal arms in the area of the temple. Nowadays the entrance of the church is on the south side as the west side is destroyed. During the years of the Ottoman occupation the church was converted into a mosque and the larger part of the unique mosaic and frescos of the interior was destroyed and whitewashed. After the liberation of the city in 1921 Osios David turned over into a Christian church again and then the famous mosaic was discovered. The visitors of Osios David have the chance to observe the beautiful interior decoration of the monastery and the unique mosaic from the 5th ? 6th century in the conch of the sanctuary and wall-paintings that date back to the 12th century A.D. 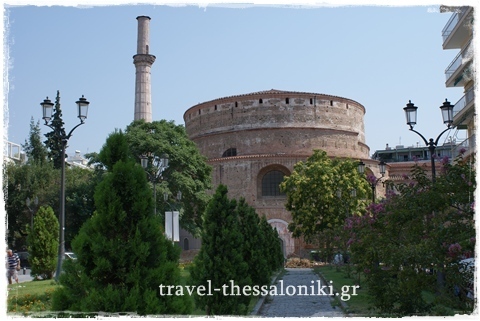 If you like museums, you will love Thessaloniki! There is a variety of museums you can visit, covering many interests from archaeology to photography and contemporary art. Designed by the Patroklos Karantinos, the Archaeological Museum was thrown open on the 27th of October 1962, a year after its construction began (January 1961). The inauguration of the museum coincided with the golden jubilee celebrations of the freedom of Thessaloniki. By 1971, all displays were in place and among the exhibits were miniature art belonging to the Classical and Archaic times, a collection from the prehistoric period and various sculptures. On the inaugural day the Museum also presented to the public their treasures unearthed from the tombs at Derveni. In 1978, some startling discoveries were unearthed at Vergina and the entire arrangement of the museum was changed in order to exhibit these. The treasures from the royal tombs were presented in an exhibition entitled Treasures of Ancient Macedonia, in the chambers housing the miniature art collection and the prehistoric exhibits. Thessaloniki was the most important European city of the Byzantine Empire, right after Constantinople. 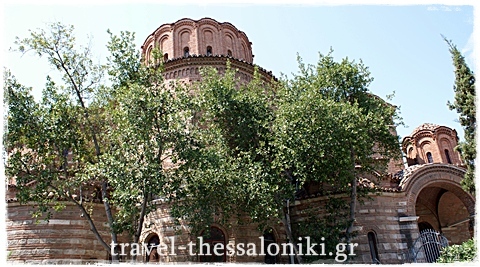 The Museum of Byzantine Culture preserves the traces of Byzantine civilisation in Thessaloniki. It also conducts studies and research programmes to unearth more evidence of Byzantine culture in Macedonia. The Museum is a repository of inscriptions, sculptures, frescoes, icons and mosaics from that era. In 1997, an exhibition named The Holy Treasures of Mount Athos was laid open to the public. This is permanent and certainly worth visiting. 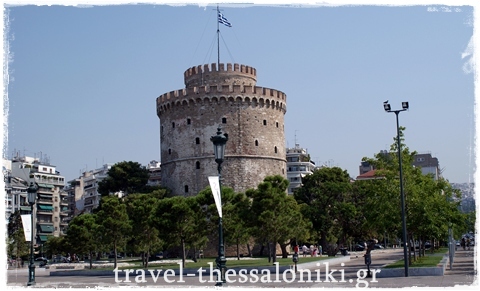 On Thesalonikis seafront stands its most famous landmark, the White Tower. It is both the symbol of Thessaloniki and the symbol of the sovereignity of Greece over Macedonia. No one knows exactly when the tower was constructed. In his description of the Norman conquest of the city in 1185, Eusthatius, the Archbishop of Thessaloniki, surmised that the Tower was probably built around the fifteenth century, in place of the existing Byzantine Tower, after the Turks conquered Thessaloniki. According to archival descriptions, The White Tower was one of the three towers of a huge fortification on the seafront and was erected at the south-eastern end. Subsequently, this fortification was destroyed in 1867 but the White Tower remained. In the course of its existence, the White Tower has had many names and has been put to many uses. It was named The Fortress of Kalamaria in the 1700s and The Bloody Tower or The Tower of the Genitsaroi in the 1800s. But in 1890, an enterprising convict secured his freedom in exchange for whitewashing the walls of the Tower. And since then, this tower has been called the White Tower. In 1912, Thessaloniki got its liberation and the Tower came into government ownership. Amongst things to do & see in Thessaloniki would be the Folklore Museum offering a glimpse into various aspects of folk life right from their housing to their costumes and dresses, handicraft, instruments etc. used everyday. Apart from focusing on folk life, the museum highlights the role of women in contemporary society. It also features exhibits on the agricultural cycle, the conflict between progress and tradition, religious festivals etc. The Museum was renovated a few years back and is today one of the best in Greece, with detailed commentaries on the various exhibits. Since October 2000, in a building that dates back to 1894 in an ex military station operates the Railway Museum. Visitors should not miss to check the impressive map with all Greek railway lines marked on it, in the master-office of the station. Other exhibits of the museum are tools, manuals and uniforms of railway workmen and also personal belongings of them. Also interesting are the details of old steam and diesel engines that are presented in the museum and used to belong to the Greek railways. You should not miss the chance to visit the restaurant carriage from the renowned Orient Express that is located in the courtyard of the museum and it is open to the public! You can also visit the room that some of the furnishings from the carriages of the former Greek Royal family are exhibited. The Macedonian Museum of Contemporary Art it was established in Thessaloniki In 1979. The Museum was originally based in the factory of "Filkeram- Johnson" and the purpose of its foundation was not only to promote Greek and International Contemporary Art but also to promote contemporary Greek cultural life abroad. You can admire a unique permanent collection of 30 works of internationally acclaimed artists that Alexandros Iolas donated to the museum, but also many temporary exhibitions. Definitely, it is a museum that worth a visit as today owns more than 2000 art pieces, such as sculptures, paintings, photographs and engravings by foreign and Greek artists. The Science Centre and Technology Museum of Thessaloniki-Noesis is situated in an area of 14,000m2, in the East exit of Thessaloniki, near the airport and next to Cosmos Mediterranean shopping centre. The philosophy of this institution is to offer the appropriate environment in order to bring the public closer to science and help them understand Technology. The exhibits and actions / activities organized by Noesis are both cultural and educational. One of the most interesting attractions is the 3D planetarium... a unique experience! Back in 1997, when Thessaloniki was Cultural Capital of Europe, the Organizing Committee founded the Cinema Museum in Warehouse 1, in the Port, at the end of the old seafront, very close to Aristotles Square. Now, the Cinema Museum has its own management committee and is important part of Thessalonikis Film Festival. Based, since 2001 in the same building with the Cinema Museum, Photography Museums history dates back to 1987 where a group of people of "parallaxi" society organized the first photography museum of Thessaloniki. Furthermore, during 1997 when Thessaloniki was Cultural Capital of Europe the Photography Museum founded officially and since 1998 the Museum is an independent body. Museums mission is to collect mainly historical and artistic photographs of Greece, organize exhibitions etc. In the museum you can find rare old photographs in permenant exhibitions, along with many temporary exhibitions from Greek and international artists. The museum of plaster casts is located at the new building of the school of Philosophy of the Aristotle University of Thessaloniki. There are two rooms in the basement of the university which house the collection of plaster casts, replicas and original archaeological artifacts. There are also copies of Kouroi and the statue of Zeus. The collection of plaster casts of marble and clay originals and replicas of works of art in metal is the finest in Greece. It is important because it brings Archaeological Department students into contact with the ancient Greek and Roman art of statue production as well as ceramics and small scale art. The Statue museum of contemporary art was established in 1997 and it is housed in the renovated building of the old Lazariston Monastery in the area of Stavroupolis in west Thessaloniki. The museums founding mission is to preserve and display works of contemporary art by Greek and foreign artists, to improve the publics aesthetic appreciation and art education. Its goal is to develop scientific research into issues surrounding the history and theory of contemporary art. It has a permanent collection but the museum also organizes periodic exhibitions. Open since 2000, the museums goal is to preserve historical memory in Northern Greece. The permanent exhibits include the Modern Greek history from the turn of the century until the Second World War. You can see photographs, uniforms, weapons, ships, maps, painting, works of art, stone engravings, air force and navy uniforms and post cards. Opening hours: Tue-Wed-Thu-Fri : 9 a.m. The building that houses the Tellogleion Art foundation museum has been quite recently constructed and it opened its doors to the public in 1999. The cutting-edge architectural design building rises in the center of the town near the citys universities. The aim of the foundation is to bring the public in touch with art. So two people gave all their fine collection of works of art and their entire estate to achieve that, and they are Nestoras and Aliki Telloglou. The greatest Greek artists of the 20th century like Bouzianis, Tsigkos, Mytaras, Eggonopoulos and many others have their works in the collection. Address: 159A, Aghiou Dimitriou St.
Open since 2001 it is a relatively new museum. It is also a very interesting museum cause its mission is to provide the visitors a glimpse at the history of supplying water to the city. Visitors can see old electricity circuit switchboards, pumping units and electricity generators. It displays steam engines and diesel engines that visitors can also see how they work. Opening hours: Mon-Fri : 10 a.m. -2 p.m. The founder of modern Turkey, Mustafa Kemal Ataturk, was actually born in Thessaloniki in a house on Apostolou Pavlou St. This house has been turned into a historical museum. The Ataturk museum is owned by the Turkish state. The building is very old and has three floors and a courtyard. All over the houses walls there are photos of Kemal and most of the furniture is authentic. The most impressive room is on the 2nd floor in which Kemal was born. Address: 75, Apostolou Pavlou St. The museum is housed in one of the rare Jewish structures that survived the fire of 1917. It was founded to hounor the Sephardic heritage as it evolved in the city after the 15th century. Central to the first floor is a narrative history of the Jewish presence in Thessaloniki from the 3rd century BCE until the Second World War. There are monumental stones and inscriptions that were once found in the great Jewish necropolis that lay to the east of the city walls. The visitors can also learn more about religious and everyday life of the pre-war Jewish community of Thessaloniki by some artifacts from the collections of the museum. Address: 13, Aghiou Mina St.
At a very well preserved Neoclassical building, in the center of Thessaloniki near Mitropolis, is housed the museum of the Macedonian struggle. It opened in 1981 and is privately owned and run by the Association of friends of the museum of the Macadonian struggle. The exhibitions have weapons, numerous uniforms and 1.350 contemporary photographs. There are also paintings of the Macedonian landscape in the late 19th and early 20th century, books, newspapers and explanatory maps. The visitors have also the opportunity to book in advance a guided tour. Address: 23, Proxenou Koromila St. The history center was established by the Municipal Council in 1983. The purpose of the center is to collect, record, rescue and preserve printed, written and audiovisual material that relates to the history of the city and wider area of Thessaloniki. This centers goal is to raise the interest of foreigners for the modern city and its historical past. It intends to convert the citys archives into electronic form. This happens so that more researchers can have access to those archives. At a very beautiful district that is called Hillia Dentra (a thousand trees) in the heart of Thessalonikis suburban forest Seih Sou, the Natural History museum has the best location for its purpose. The museum is inside the zoo on Kedrinos Lofos and it is open since 1994. There are various species of fauna of Greece. Animals are displayed in natural attitudes. Visitors can see a wide variety of birds, mammals, skeletons, reptiles, rocks and bones. The showcases are eight and they display the mouth of the River Axios, a typical forest in Macedonia from 100m to 1.000m above sea level, rock samples, stuffed owls and eagles, a snowy landscape at alpine level, skeletons and bones of mammals and birds, highland and lowland reptiles. The museum is open since 1997 in a restored building in the Ladadika district. The area is near the port at the downtown Thessaloniki. There are three exhibition spaces, a music library, an electronic archive of scores and musicology research departments. The exhibitions display over 200 musical instruments which existed between 2.800 BC and 20th century. The Aristotle University of Thessaloniki has helped to reconstruct the instruments. Apart from the pictorial evidence that accompanies each instrument in many cases you can also hear the sounds they make. This was the first organized visual art constitution in the city when it was founded back in 1975. In the same building is also housed the State Theater of Northern Greece. It is purposed to promote the Greek modern art and mostly that of Northern Greece. Most of the artwork has been donated. There is space to display only 150 works and the gallery is interested in organizing solo or group temporary exhibitions. At the Vassilisis Olgas St. is standing the restored Villa Ahmet Kapuji which houses the Cultural Center. It was built in 1898 and was used by Eleftherios Venizelos. Afterwards it was used as a high school. The cultural center was established in 1989 and is a department of the National Bank. It mounts exhibitions, shows films and holds lectures. The visitors can also admire exhibitions on the history of Thessaloniki, Mount Athos and Northern Greece in general. Address: 108, Vassilisis Olgas St. Founded as an offshoot of the Municipal Library, the gallery is housed in the Villa Mordoch, which was designed by the architect Xenophon Paionidis. It has more than 1.000 works in its collection. The gallery organizes regular exhibitions of Greek artists, has a library-reading room and produces numerous publications. You can book in advance a guided tour. The aims of the gallery are to work with mire institutions in Greece and abroad and also to convert the second and third floor into permanent exhibition spaces for Thessalonikean artists. 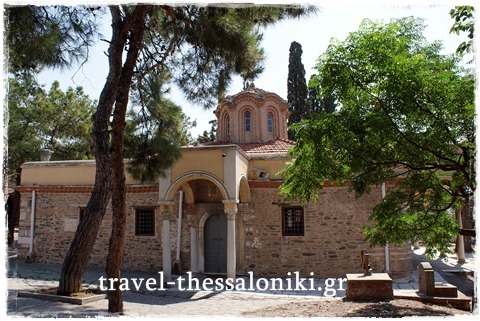 Except from Thessaloniki museums, there is a wide variety of museums in many cities in Northern Greece. The following list shows some of the most interesting and distinctive. You can visit these museums on day trips from Thessaloniki as most of them are located less than 2 hours away from Thessaloniki. The Folklore museum was founded in 1968 in Naoussa purposed to save and preserve the customs of Naoussa and the surrounding area. It was established by the Lyceum of Hellenic women. The museums exhibits are authentic local costumes, clothing, leather trunks, weapons of great value, women textiles and the authentic uniform of a Macedonian freedom fighter. There is also a reconstruction of a traditional sitting-room and other interesting exhibits. The museum is housed in the Bezesten in Eleftherias Square in Serres. The Bezesten is a fifteenth century building which was erected by the Ottoman Turks and there are only two left in Greece now, one is in Thessaloniki and the other is in Serres. It used to be a covered market. The building after been restored and renovated is now in a very good condition functioning as an archaeological museum. Inside the museum are archaeological exhibits from all periods from the wide Serres area. There are prehistoric exhibits that have been excavated at Kryoneri, Promaxona, Terpni, Gazoros, Neos Skopos and Serres. The museum was built in 1966 and was complemented and extended in 1971. It belongs to the Ministry of National Defense, which has the responsibility of the museums operation. The visitor can see at the two adjacent halls of documents of the Balkan Wars of 1912-13, like personal belongings of officers who took part in the battle of Kilkis, military uniforms, weapons,flags, etc. Only two kilometers from the Thessaloniki-Kavala national highway is located the Archaeological museum of Amphipolis. It is just above the mouth of the River Strimon where the ancient town Amphipolis used to be. The building that the museum is housed is new and was completed in 1995. The most important exhibits are a seal and a number of the Neolithic period, a figurine of a dancer performing the Peirihios Dance, gold jewellery, three statues of Orestes and Electra, Aphrodite and Eros and a female figure. There is also a siren tearing her hair and beating her breast, silver ossuary and mural paintings. The museum opened its doors in 2002 in Veroia. The building that it is housed is the old Markos mill adjacent to the city walls. The monuments that date from Byzantine and Post-Byzantine times are found in Veroia and the surrounding area. The museum was founded to make known to everyone the traditions of the area and the great wealth of Veroias monuments. On the first floor of the three-storey building is hosted the "Veroia, part of the Byzantine Empire" exhibition. The collection consists of wall paintings, ceramics, wood carvings, pottery and mosaic floors. The museum is located at the center of Arnea and is housed in an 18th century two-storey mansion. At the ground floor there are exhibits of representative samples of Arneas architectural heritage. There are also traditional folk instruments and agricultural tools. At the mezzanine there are tools of preparation and serving coffee and at the first floor tools on textiles as well as household items (cookware, boilers, and washing tubs). It was established in 1978 and its exhibits include models of the mausoleum of the ancient man of Petralona, the oldest fire (1 million years old and more), stone and bone tools which were found in New Triglia of Chalkidiki (11 million years old). The findings of the open space are from the pre-cave period from New Triglia, Ptolemaida Chalkidikis, Evia, Aegean and other places in Greece. There are findings from Africa too. At the center of Polygyros is located its Folklore museum and is housed in the two-storey Karagani house. The first floor of the house represents an urban house of the early 20th century and in particular the lounge, the bedroom, the kitchen and in a separate room there is a loom. Authentic traditional costumes, from the region of Polygyros, are scattered and exposed in various corners of the house. Finally, at the ground floor are exposed some agricultural plowing, sowing, harvesting, threshing and harvesting olives tools. The museum opened in December 2002. It is housed at the traditional building of Gianni Boutari at the center of Naousa and all the exhibits are donated by the winemakers and the residents of the area. The museums aim is primarily educational, to publicize the history of wine and winemaking in Naousa and the region. Some of the exhibits are: the old winemaking tank of Boutaris family, wine barrels, carboys, baskets and tools of wine. The Folklore museum of Edessa is housed in a two-storey building in the Varosi district. The building was especially granted by the Sivena family. The museum exhibits samples of folk culture of the area. At the first floor the visitors can see objects, tools and photographs of agriculture, farming, weaving and other activities, as well as local dresses, everyday and formal. At the second floor the exhibits follow the circle of human life (birth, marriage, death) and utilitarian objects associated with traditional professions. Thessaloniki has a huge park - almost a forest - as well as some very scenic locations like Oreokastro, Panorama and Hortiatis that attract a lot of visitors. The biggest draw is the Horiatis Mountain, which provides a refreshingly cool retreat in summer and an awesome sight in winter when it is covered with snow. The Hortiatis village is also famous for its tavernas, which offer some delectable meat dishes and retsina, a typically traditional Greek wine for which you need to acquire a taste. You can chill out in front of a fire, enjoying some kokoretsi, which is a special dish made from the liver of lamb, or you can feast on fillet of lamb on a skewer and wash it down with a peg of retsina! Panorama is an upmarket suburb which offers a scintillating view of the hills around it and the bay. You can stroll around drinking in the beauty of this scene and then step into one of the many restaurants or patisseries in its international shopping arcade and grab a bite! To catch a memorable sunset, park yourself at one of the many small fishing villages or at the beaches at Asprovalta near the Thermaikos Gulf, Epanomi, Aretsou, Perea, Nea Mihaniona, Nei Epivates and Agia Triada. Nested picturesquely between two separate mountain ranges in the centre of Northern Greece is Lake Kerkini, one of the true jewels of European birding and the core of a Nature Reserve that is a relatively unexplored wonderland of beauty and biological diversity. Kerkini is a wetland of great national and international importance. It supports rich bird populations in terms of both number and diversity, including rare and endangered species. The wetland is very important as a feeding ground for birds of prey nesting in the nearby forests, as a wintering and intermediate station for migratory birds, as well as a breeding area for a large number of birds. The increased biological productivity and the existence of rare plant species (Marsilea quadrifolia, Utricularia vulgaris etc) and also rare and diverse fauna within the site and in the forest ecosystems surrounding it increases even more the ecological value of the area. In the running waters of the area around the village Agistro, there is a population of wild trout, Salmo macrostigma which is endangered by neighbouring cultures of the species Oncorhynchus mykiss. Concerning the wild growing plants the quality of the site is indicated by the occurrence of 4 important taxa. Among them, one taxon is protected by the EC Environment Legislation (1992), 2 taxa (Salvinia natans, Trapa natans) are included in WCMC and one taxon (Himantoglossum hircinum) is protected by the Greek Presidental Decree (67/1981). Thessaloniki hosts many important international festivals at the various heritage monuments, museums, bookshops, galleries and cafes. The Thessaloniki International Trade Fair has been held every year, for the past eighty years, at the Thessaloniki International Exhibition Centre. More than 300,000 visitors attend this important festival every year. Thessaloniki also hosts the International Film Festival, which is one of the more significant film festivals of the Balkans and South East Europe. Famous film makers like Francis Ford Coppola and noted actors like Catherine Deneuve, Irene Papas, Faye Dunaway and Fatih Akin make it a point to attend this festival. In 1999, the Documentary Festival was established to showcase documentaries that focus on global cultural and social developments. Many of the films screened here go on to win accolades like the FIPRESCI and Audience awards. Music, dance, theatre and exhibitions dominate the Dimitria festival, which has been going on since 1966. Dedicated to the patron saint of Thessaloniki, St. Demetrius, the festival showcases the rich local talent. DJs and music jockeys from all over the world converge at the DMC DJ Championship held at the International Trade Fair. The Arch of Galerius (Modern Greek: Aψίδα του Γαλερίου) and the Tomb of Galerius (Τάφος του Γαλερίου) are neighboring monuments in the city of Thessaloniki, in the province of Central Macedonia in northern Greece. The Tomb of Galerius is better known as the Rotunda, the Church of Agios Georgios or (in English) the Rotunda of St. George. Built shortly before A.D. 305 in commemoration of Galerius victory over the Persians in 297. It was a part of a four gateway which was situated at the point where the ceremonial way from the palace complex met the citys busiest thoroughfare. The reliefs depict and extol the Emperors victory over the Persians. It is located at the junction of Egnatia and Dimitriou Gounari streets. 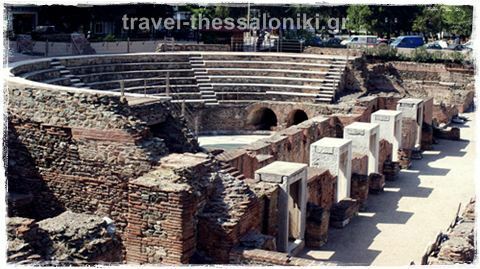 It was built in A.D. 300 in the center of the Roman Thessaloniki. Some parts of the palace are still visible. Located in Dimitriou Gounari street. A circular building erected in A.D. 306 as the Pantheon or Mausoleum of Galerius. Under Theodosius the Great it became a Christian church with only a few additions or alterations. Its mosaics are unique for the era (4th century). Located on Dimitriou Gounari street. A variety of Thessaloniki hotel accommodation makes this an ideal holiday destination. One of the Thessaloniki highlights is its impressive coastline where there are many beaches with crystalline waters. Some of the better beaches that offer excellent swimming possibilities are the beaches at Aretsou, Asprovalta, Perea, Epanomi, Nei Epivates, Agia Triada, and Nea Mihaniona.